Turkish Delight or Arabic Locum (rāhat al-hulqūm), “throat comfort” dates back more than 230 years, making it one of the oldest sweet dishes in the world. Something from my North African “cookhouse” …………. 2) Combine 80gm corn flour with 50ml water to form a paste. Set aside. 3) Sprinkle gelatin onto 125ml (½ cup water). Set aside. 4) Place reaming water, sugar and rose water, lemon juice into a large saucepan and heat gently until the sugar has dissolved. Add the corn flour paste, whisking continuously. Cook mix for about 10 min. 5) Melt gelatin mix on defrost setting in microwave for a few seconds. Add the gelatin in a thin stream to the sugar mixture. Stir in the food coloring, pour into lined baking tray and allow to set at room temp. 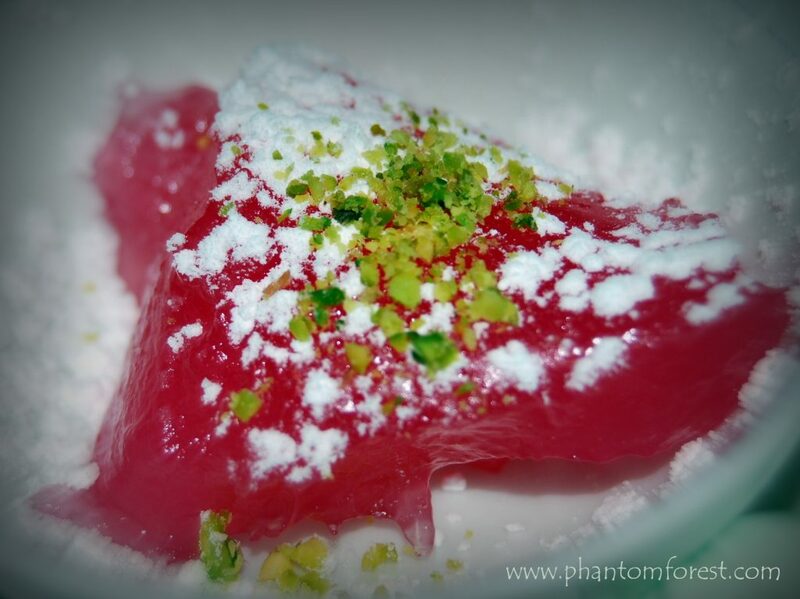 This entry was posted in Phantom Feasts and tagged moroccan, Turkish delight. Bookmark the permalink. ← Beautiful and Enchanting. Our Indigenous Forests of the Garden Route.